Black Nazarene devotees participate in the Traslacion, January 9, 2017. Photo by Bernard Testa, InterAksyon. 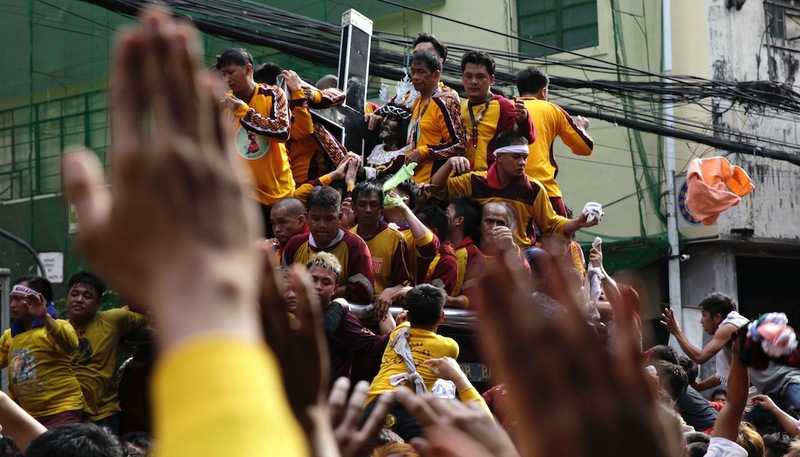 On Monday, January 9, thousands of devotees thronged the streets of Manila to once again take part in the traslacion procession where the image of the Black Nazarene is brought back to its home in Quiapo Church. The Traslacion, literally “moving something from one place to the other” in Spanish, is the culmination of the Feast of the Black Nazarene that begins during the last days of December. The time-honored tradition, an impressive spectacle of human mass (imagine the stench and sweat!) with many intent on getting close to the revered image, is a testimony to the Filipino’s strong sense of sincere, sometimes fanatical, sense of piety. 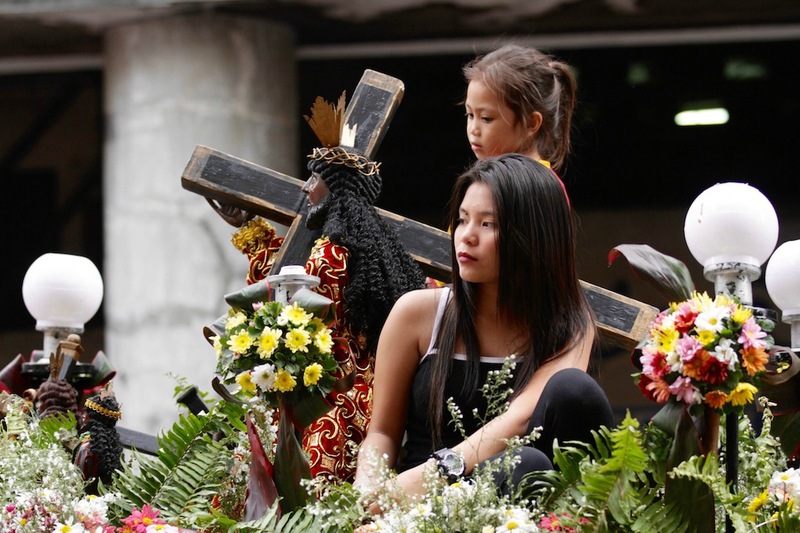 It may as well be proof of how faith continues to play an important role in uniting Filipinos no matter how diverse each devotees’ economic background even social or political persuasions may be. Black Nazarene devotees have their photo taken during the Traslacion, January 9, 2017. Photo by Bernard Testa, InterAksyon. But whether one participates in this annual religious exercise for gratitude to an answered prayer, to make a plea for a miracle, or simply to engage in one of the world’s most written about rites, there is no denying that each year, the Traslacion truly leaves an enduring impression on its participants and even among the mere witnesses. 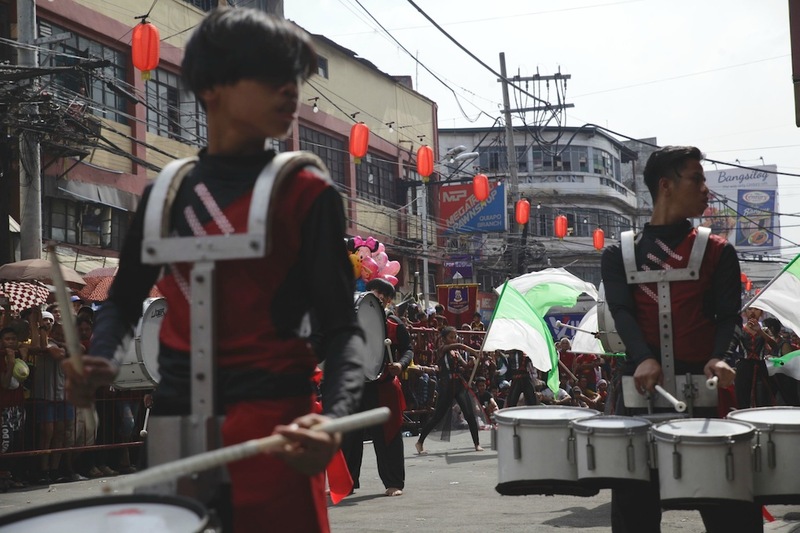 Members of a drum bugle corps play along the streets of Quiapo in Manila during the Traslacion, January 9, 2017. Photo by Bernard Testa, InterAksyon. 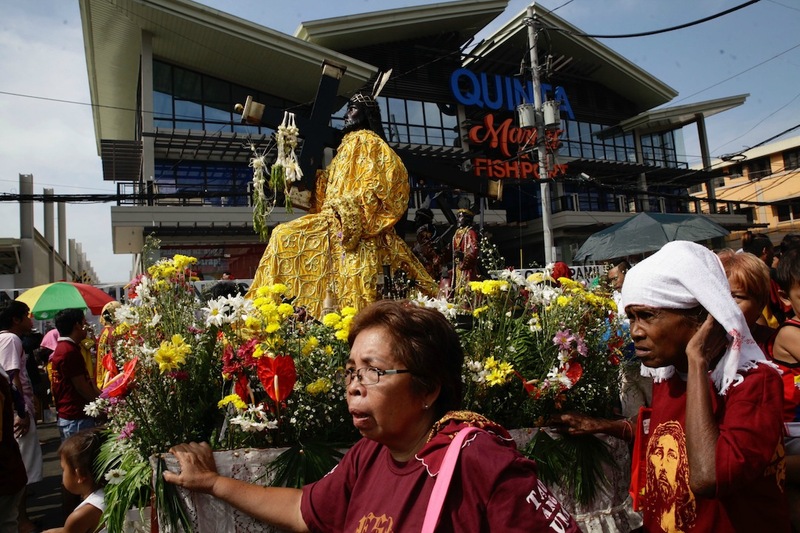 Devotees parade a replica of the Black Nazarene image during Traslacion, January 9, 2017. Photo by Bernard Testa, InterAksyon. 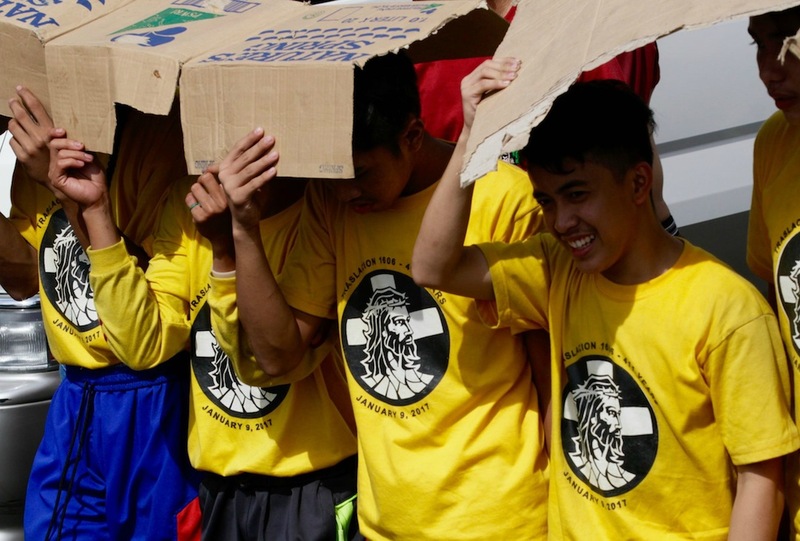 Devotees protect themselves from the heat during the Traslacion procession on January 9, 2017. Photo by Bernard Testa, InterAksyon. 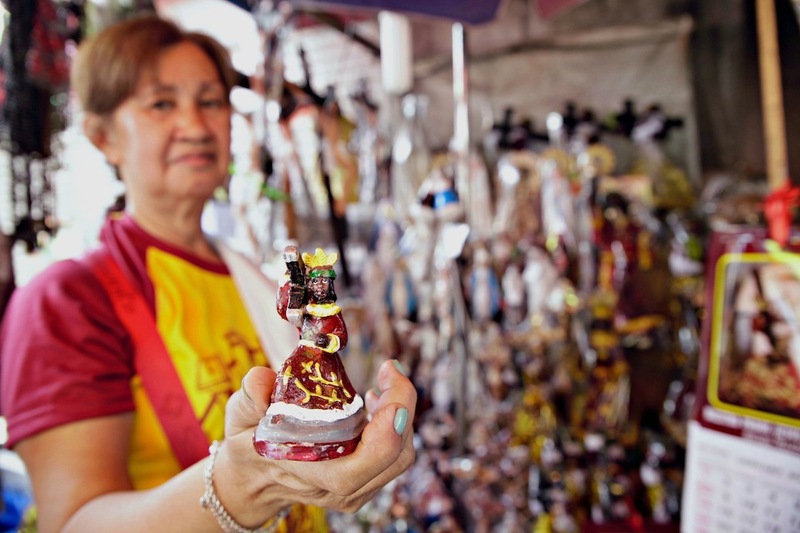 Aling Josie shows one of the Black Nazarene images in her store in Quiapo, Manila. 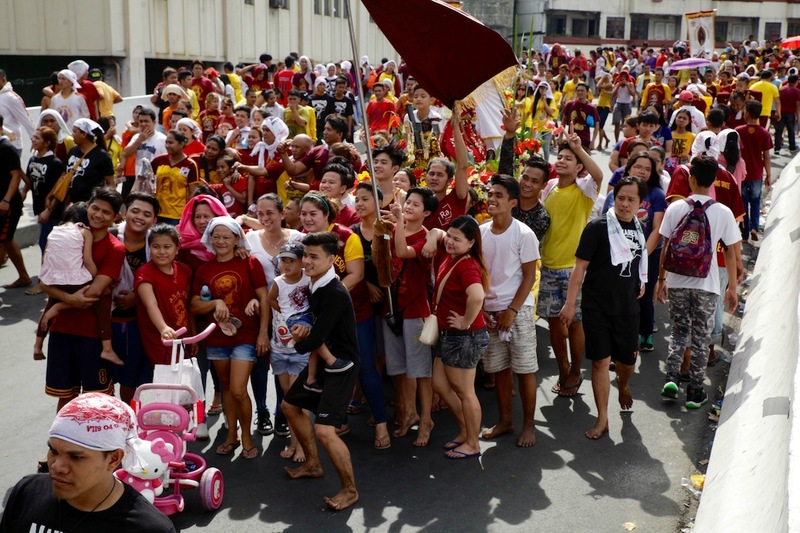 On January 9, 2017, thousands of Black Nazarene devotees participated in the ‘traslacion’ procession. Photo by Bernard Testa, InterAksyon. 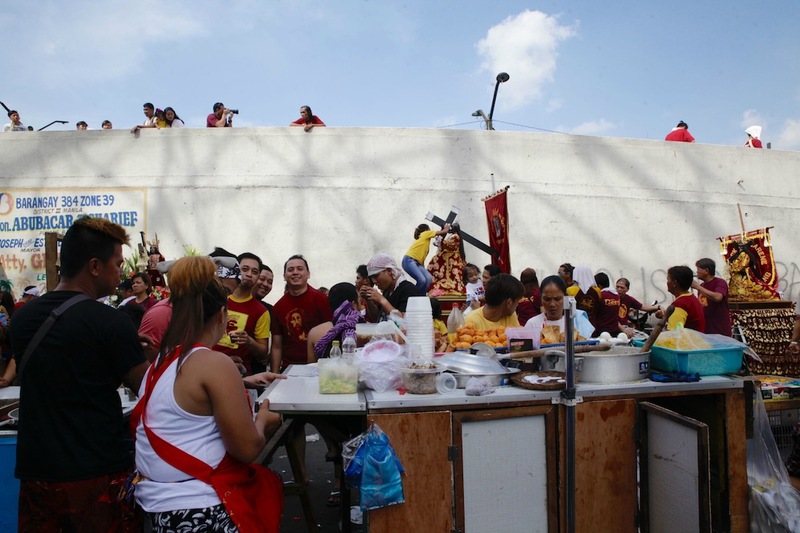 Devotees participating in the ‘traslacion’ procession grab a quick meal at a congee vendor’s makeshift stall. Photo by Bernard Testa, InterAksyon. 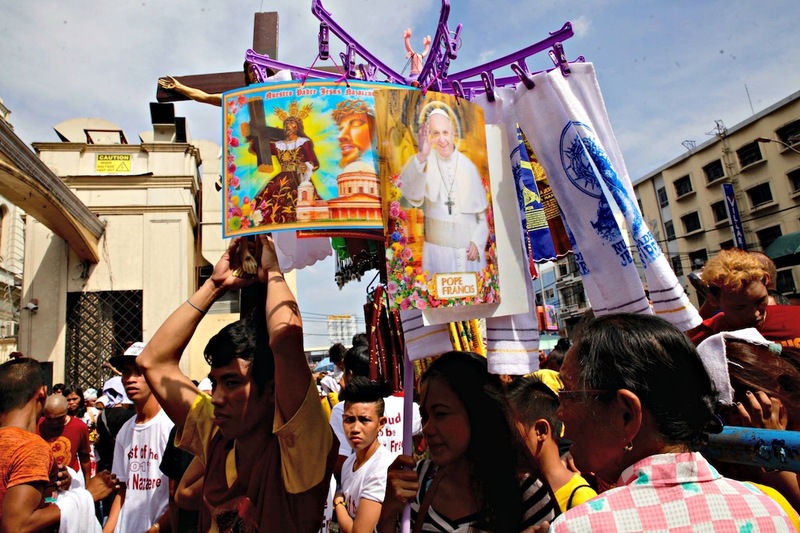 A vendor sells posters of the Black Nazarene and Pope Francis during the ‘traslacion’ procession on January 9, 2017. Photo by Bernard Testa, interaksyon. Young girls join the parade of Black Nazarene repilicas during the Traslacion, January 9, 2017. Photo by Bernard Testa, InterAksyon.